I am broadly interested in the mechanisms that allow populations to adapt to different environmental conditions (e.g. seasonal and/or clinal variation), particularly when there is some stochastic environmental variation. I started my academic path in the Biology program at Faculdade de Ciências da Universidade de Lisboa (FCUL) graduating in 2006. Throughout the program I had some cool classes that guided me towards one of my favorite questions in evolutionary biology: How do species adapt to a new environment? So, I did my master’s thesis in Margarida Matos’ laboratory (FCUL). Between 2010-2015, I developed my PhD thesis under the supervision of Margarida Matos (Centre for Ecology, Evolution and Environmental Changes, FCUL) and Mauro Santos (Universitat Autònoma de Barcelona) on “The role of history, chance and selection during adaptation: an integrated perspective.” My thesis was developed in the Local Adaptation in Drosophila sub-group, which belongs to the Evolutionary Ecology research group in the cE3c. You can say that up until now I have been studying how populations adapt to a common environment, using experimental evolution and looking at different biological levels (phenotypic, karyotypic and genomic). I am currently a postdoc in Claudia Bank’s lab in the Instituto Gulbenkian de Ciência. My current research projects focus on understanding the effects of synonymous mutations on changing the accessibility of adaptive paths and study how gene expression and changing environments affect the shape of the fitness landscape. 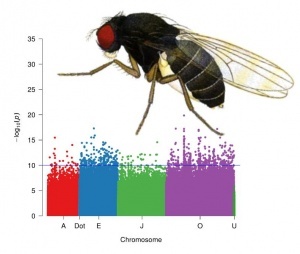 I also continue my collaboration with the ‘Local adaptation in Drosophila’ team to try to understanding the repeatability and predictability of evolution in the laboratory at different biological levels. Fragata, I., Simôes, P., Szathmáry, E., Matos, M. & Santos, M. (2018) Playing evolution in the laboratory: From the first major evolutionary transition to global warming. Seabra, S.G., Fragata, I., Antunes, M.A., Faria, G.S., Santos, M.A., Sousa, V.C., Simões, P. & Matos, M. (2018) Different genomic changes underlie adaptive evolution in populations of contrasting history. Simões, P., Fragata, I., Seabra, S.G., Faria, G.S., Santos, M.A., Rose, M. R., Santos., M. & Matos, M. (2017) Predictable phenotypic, but not karyotypic, evolution of populations with contrasting initial history.